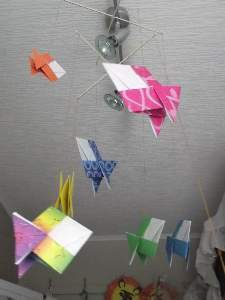 Make a hanging fish mobile to stare at when you`re banished to your room for something you never did. 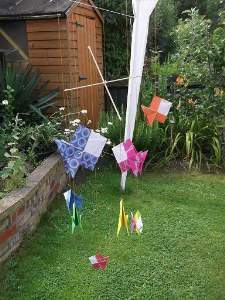 The fish are origami fish. What? You never tried origami before? Well these are easy enough to master, but if you still think it will be too much of a challenge, you can always go for cardboard cut-outs. First make up 8 origami fishes of various colors and 4 and paired at 4 different sizes. 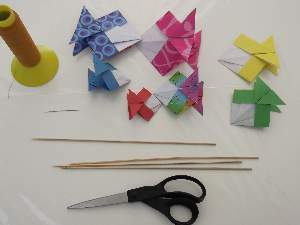 Instructions on how to make the ﻿﻿﻿﻿﻿﻿﻿﻿﻿﻿﻿origami fish﻿ in clear steps can be downloaded from a free printables list available after signing up for our weekly newsletter. Each fish must have a partner the same size to balance your mobile. 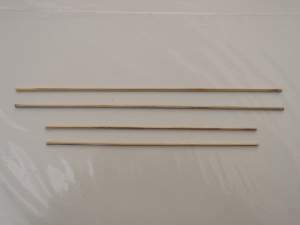 Cut off the sharp ends of your skewers making one pair much shorter than the other. Find the exact middles and mark the smaller skewers. Now cross them and fix in place with the glue gun. Tie the end of 50cm of string to the middle and again fix with some glue. You can use PVA glue but it will take longer to dry. 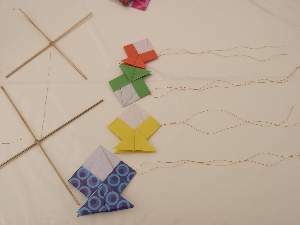 Cross and join the larger skewers together the same as the smaller ones and then tie them half way along the string to make a 2 tier mobile. Fix in place with glue. You need to make sure you have enough string at the top to fix to the ceiling or wherever you intend to fix your hanging fish. 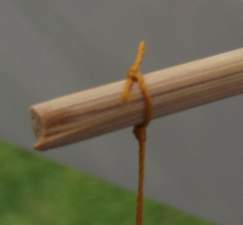 Thread the needle with a length of thread or thin string. Make the thread different lengths for each hanging fish. 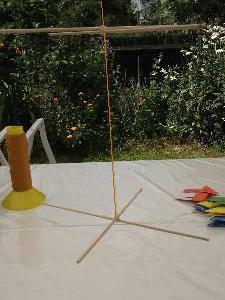 Range them from 30cm to 75cm. Now push the needle through the top fin of the fish to thread it. Tie the thread at the fin and do the same to the other 7 fishes. Now tie each fish to the end of a skewer with it`s partner on the opposite end. 4 on the top tier and 4 on the bottom tier. Your mobile is complete and ready for displaying in your room. If the hanging fish happen to be unbalance, don`t be disappointed you can soon rectify the problem. I have deliberately made a pair of fish unequal in size and it`s making my mobile tip as you can see in the picture. I fixed it by putting some weights in the flap of its partner fish.